River Forest, Illinois - Friday August 4, 2017 - 5:30PM CT (local time): I walked with my 3 girls to the corner 7-11 after my oldest got out of soccer practice. We usually do this after each one has practice as a little treat run before walking home. This day was overcast and quite a bit cooler than the previous days, which were very hot and muggy. After we got our Slushies and other snacks, we proceeded to walk home along the usual route which takes us past the practice fields at Dominican University. We were all talking and laughing when I spotted what looked like a giant bat flying just above the treetops at the corner of Division Street and Williams Street where we cross the road to head toward home. I showed it to my girls as the bat turned toward where we were standing. This sudden move scared my 5 and 7 year old who cowered down and screamed. The bat was flapping it's wings and flew above us and over the football field. It then banked and flew off in a southwestern direction and disappeared over some treetops. We stood there for about 2 minutes stunned before I collected my girls, who were scared and sobbing and I continued the rest of the way home. 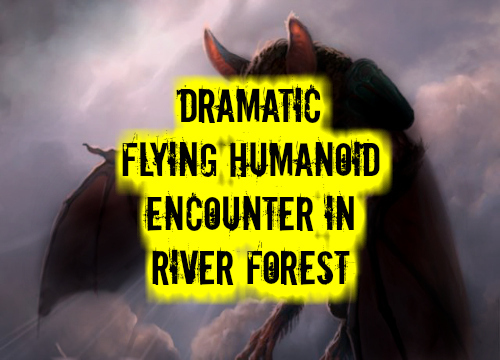 The bat looked like it had human-like arms and legs, just a lot bigger and had a large pair of bat-like wings that it flapped as it flew. It was black with some grey, but there were no distinguishable features. I know what I saw was real and had to be a living creature. There was no sound, but it was a solid object. I asked each of my girls to describe what they say saw and they all agreed that it looked like a huge black bat. They were very scared and I had to explain to them that we might have just seen a very big bat and there was nothing to be scared of.